1.Preheat oven to 325°. Line rimmed baking pan with parchment paper. In food processor, pulse graham crackers, flour and salt until fine crumbs form; transfer to medium bowl and stir in 4 tablespoons melted butter. Spread graham cracker mixture on prepared pan. Bake 13 minutes or until golden brown, rotating once; cool. 2.In medium bowl, toss peaches, sugar, 1 tablespoon lemon juice and remaining 2 tablespoons butter. Heat large skillet over medium heat; add peach mixture and cook 5 minutes or until peaches are soft. Cool slightly. 3.In small bowl, with fork, mash raspberries and remaining ½ tablespoon lemon juice. 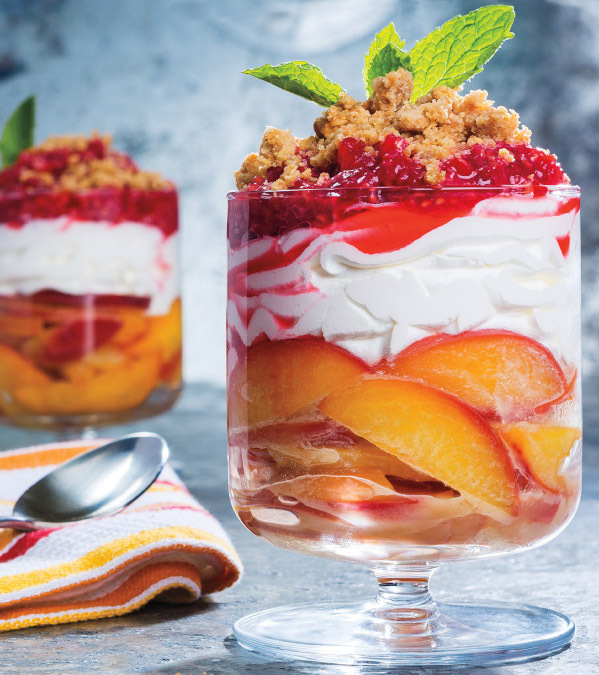 4.In 4 (5-ounce) glasses, layer peaches, whipped topping, raspberry mixture and graham cracker crumble.